If you’re looking for supreme quality at competitive prices; look no further! Belong hair bring you our ultimate range of extensions featuring top range of human hair . Hair sourced from Belong is known to be long lasting, soft to the touch and made to the finest standards. 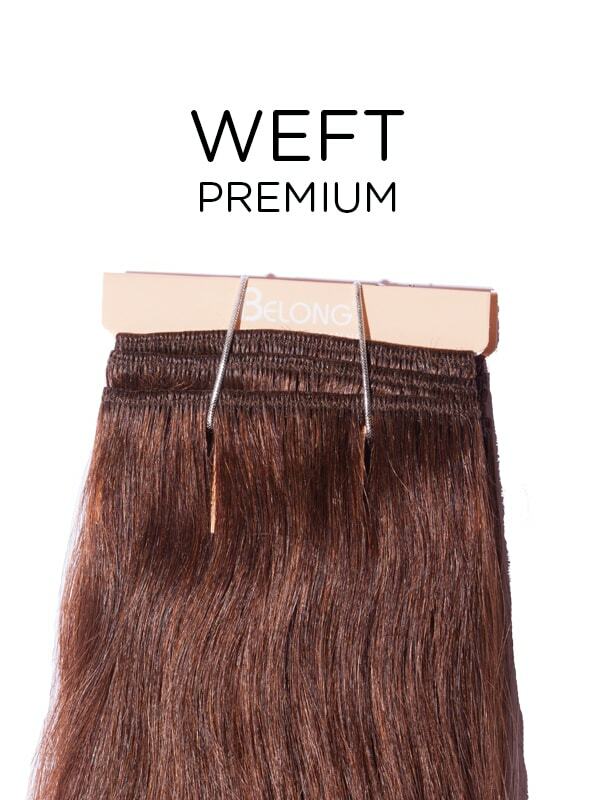 7A Supreme weft is full and thick, providing the ultimate in volume and top quality. With completely no tangling at all, a natural healthy sheen and a frizz free finish guaranteed each time, you can have achieve show stopping style you’ve only dreamt about. The hair will remain silky straight time and time again. Weighing in at 150 grams there is enough hair to enhance an average full head. Make sure you care for your hair extensions with the correct products to keep them looking healthy for 12+ months. Everyday shampoos and conditioners don’t provide the nutrients that are needed to maintain the look and feel of hair after it has been removed from the scalp. Instead invest in specially designed aftercare which has the ingredients necessary to help hair stay pristine for longer. By measuring the weft up to your head, you can cut individual sections which fit your head perfectly. This allows for more customisation and better overall coverage. Once cut, you simply sew snap clips along the edge of the weft using a thread and needle. The metal snap clips have small holes in the top corners to sew through. This involves cutting the weft into sections or strands and using bonding glue to attach to the natural hair. The glue can be from a bottle, glue gun or hot pot. The glue often needs a couple of minutes to dry and in this time it is recommended to apply pressure to ensure a firm bond. With this procedure the hair is sewn onto the head using a weaving thread and needle. Firstly the natural hair is braided into cornrows which allows the sections of weft to be easily attached. This method is usually done by professionals. Similar to the bonding method, the weft is cut into pieces which are attached to the natural hair with the use of micro rings. Hair from the head and from the weft have to be threaded through the micro ring using a wire loop or needle pen. Once in place, the micro ring can be squeezed shut with pliers to secure in place. The rings are spaced out equally along the pieces of weft to hold the weight. Using specially designed double sided extension tape the hair is cut into sections and the tape is stuck to the machine wefted edge. After selecting a section of your natural hair, peel the backing paper off the tape and stick this underneath your hair with the tape side upwards to attach to the hair. Then take another section of weft, peel the backing paper off the tape and apply face down onto the same piece of natural hair. This should form a sandwiched effect with your own hair in between. The adhesive tape then bonds together to form a secure grip. 7A Supreme is the best hair you ever can have, lovely texture and long lifespan.